If you chose "No Engraving" above, simply write "No Engraving" here to confirm otherwise you may enter what you would like your ring to be personalized with here up to 25 total characters, spaces, symbols or other. Message me if you have questions. This beautifully designed ring was a custom order request by a clients wife who wanted to make her Irish hubby who's birthday was also Emerald Green to top things off a unique design "to bring him the luck of the Irish". Whether you're Irish, your birthday was in the month of May and Emerald is your birthstone, you would like a little added luck to your life or would like a stylish and unique looking Celtic ring, this one covers it all! The ring cost the client $299.95 to custom make but because I make my rings in small batch runs, I have several and going to let a few go on sale for a couple weeks to pickup a few nice ETSY reviews and then it'll go back up to or near it's original price. 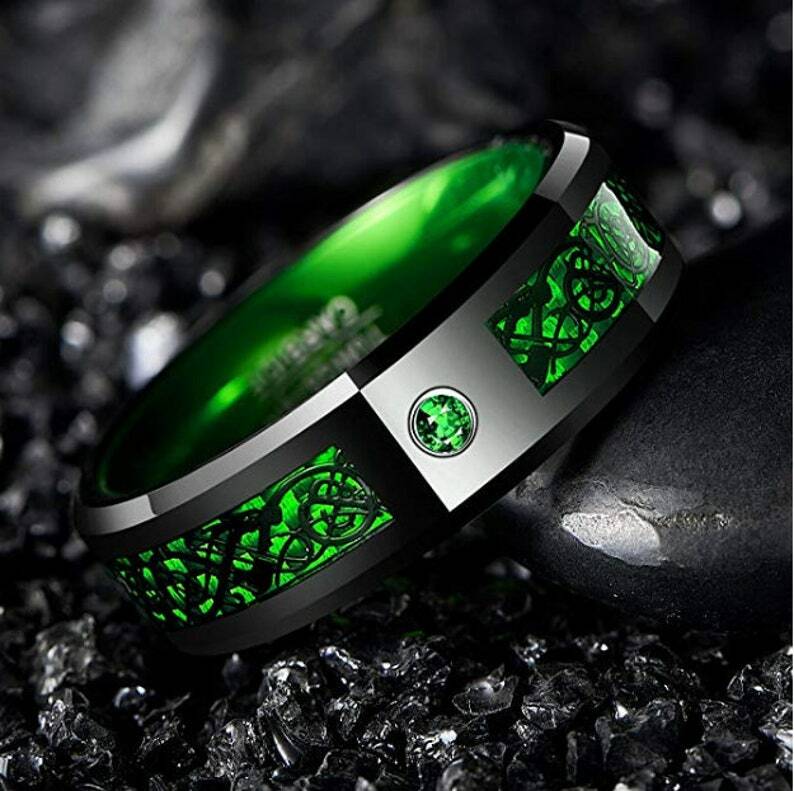 ▶ Genuine tungsten carbide, durable and scratch-resistance. ▶ Free velvet ring box, value is $9.99, saves your gift wrap service fee and helps you store the ring easily. ▶ Perfect for wedding, engagement, anniversary, homecoming, thanksgiving day, christmas, valentine's day, st. patricks day, dating, banquet, church, dinner, cocktail, evening and every day wear. The ring is not only perfect for normal wear but also makes a nice replacement to any wedding band that might have been lost or just as a second to wear at work so you don't damage your original ring set. Shipping Available Internationally or you may pickup for FREE in Chino Hills, California 91709! If you are near enough to me to do so, just make your purchase here and I'll refund what ever you were charged for shipping upon pickup. Milling Time: 2-3 Days however I often have these ready to ship the same day ordered.